Bathroom vanities are not created equal. 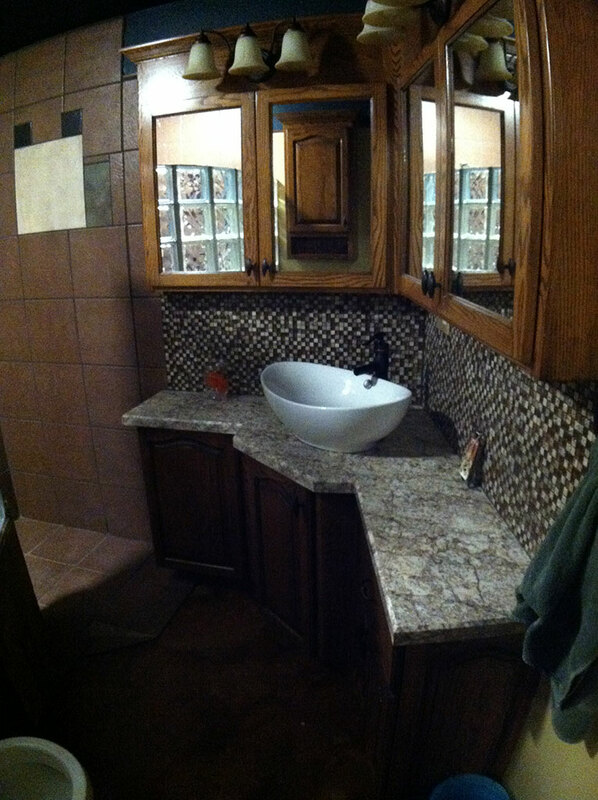 We do a wide variety of custom bathroom cabinets. 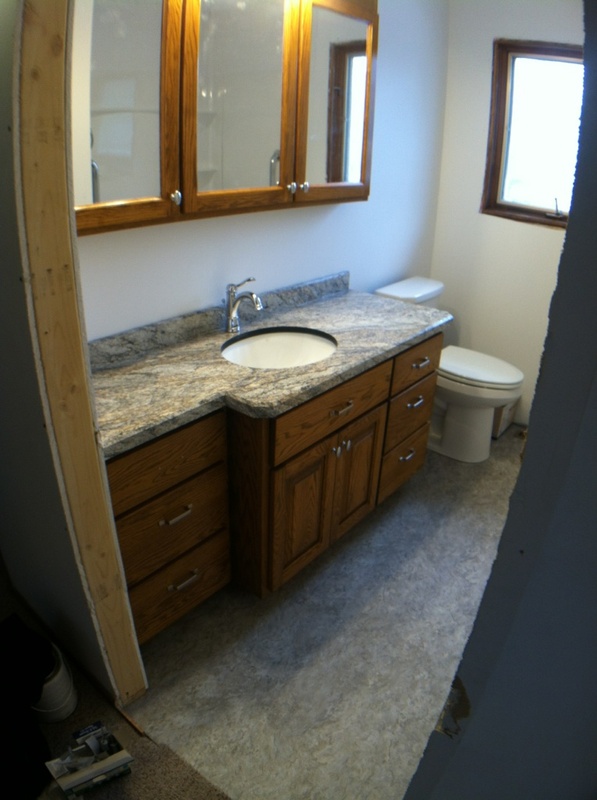 Recently we got called into a consultation for a bathroom that had to be remodeled to become handicap-accessible. The new wider door was going to hit their existing cabinet. Not a problem, we made that side a little narrower and it worked perfectly, as well as giving some texture to the finished project. We also built it a little shorter to accommodate the height of the customer. 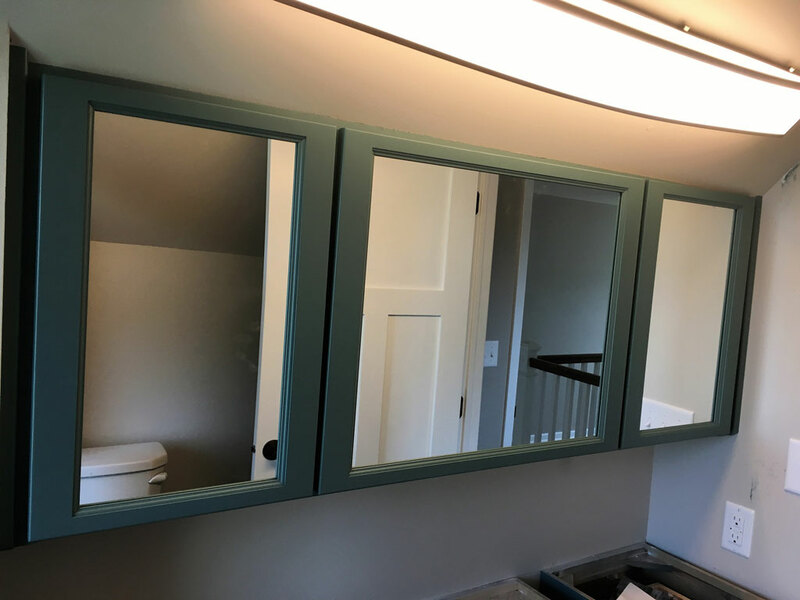 And while we were doing that we built a matching medicine cabinet. Speaking of shorter. 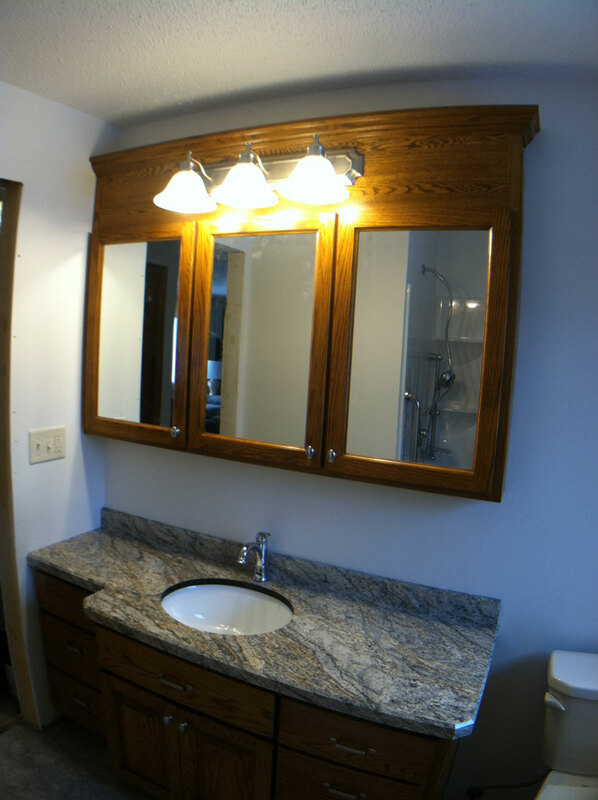 Typical big box store vanities are built at a 32″ countertop height. While that is ok for some, it is a long ways down to the counter for most people. Quite often we build them at a kitchen-counter height. Maybe it’s just me but I would rather lean down than bend double when brushing my teeth. Sometimes custom means a certain color. Often someone will bring me a piece of trim they used in the house and say, “Make it that color.” Why would you take an off-the-shelf stain and almost get close rather than get a custom-matched stain that will fit in with the rest of the house? Or maybe the color you want isn’t a stain but a paint color. We can match almost any color if we have a paint name and brand. We simply forward that to our lacquer genius and he makes a lacquer of that color. Or maybe you have an odd-shaped bathroom. In the vanity featured below, the corner is not a 90-degree angle, so we had to make a cabinet that would fit that unusual angle. We made not only the cabinet but also a seamless Bianco, Romano, bevel-edge countertop, and a matching medicine cabinet. 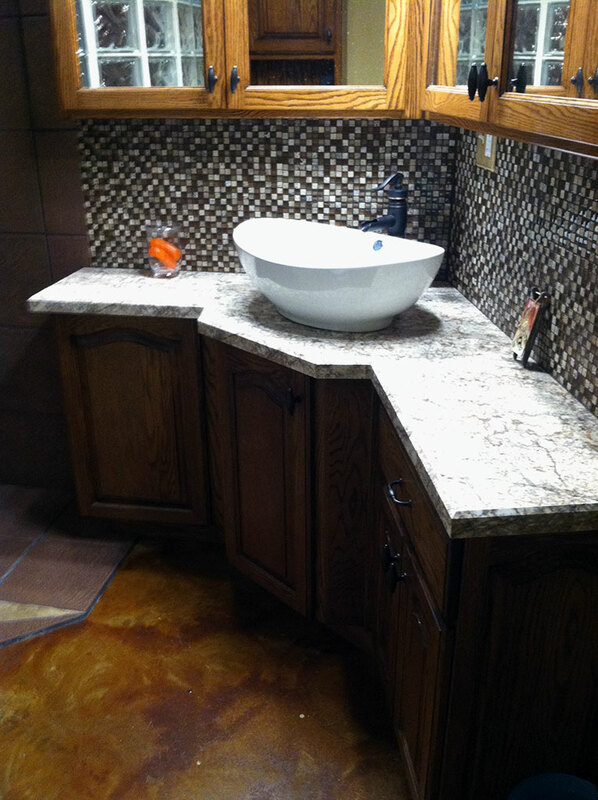 This vanity is short to accommodate the tall vessel sink surface mounted on the counter top. 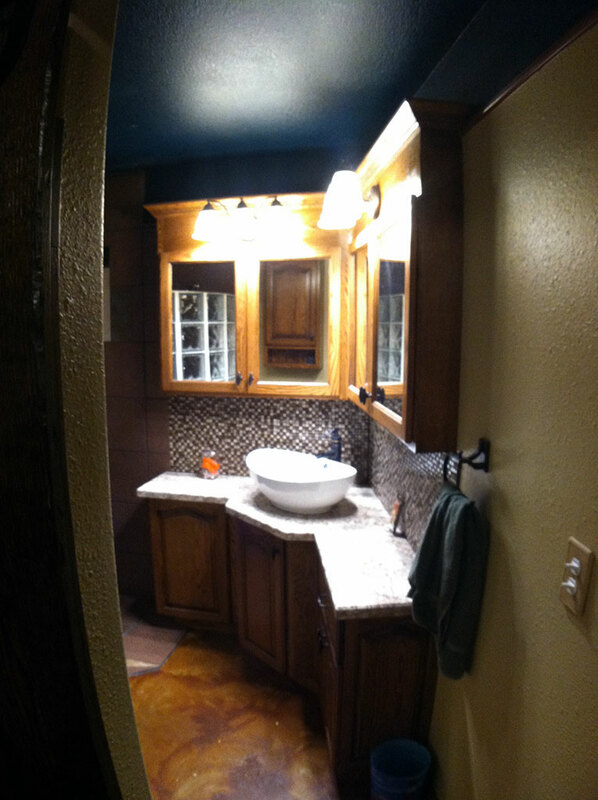 It is backed with a custom, glass tile backsplash that adds a warm feel to the cabinets. 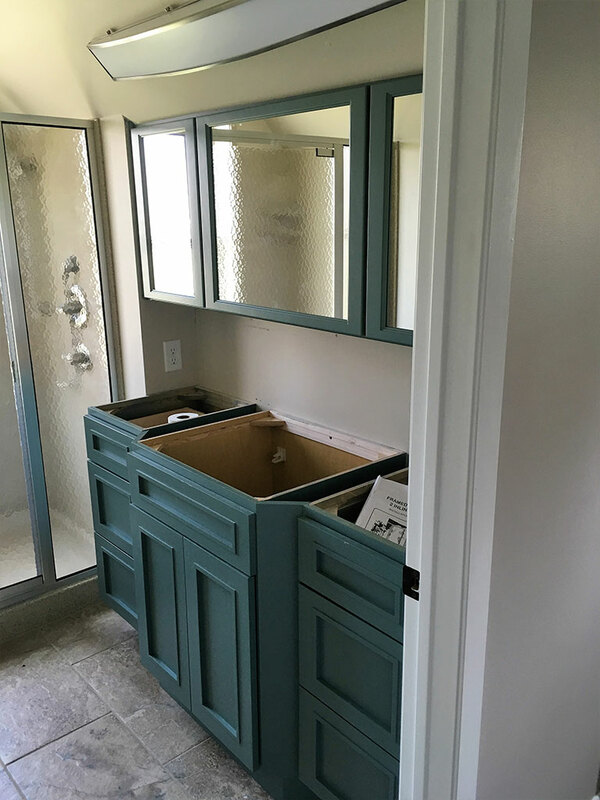 So if you are thinking about a bathroom remodel or just upgrading your vanity, give us a call and we can come up with a style, color, and height that works right for you.